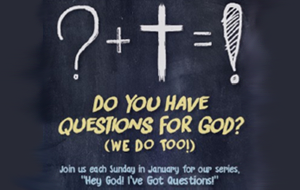 New Sermon Series beginning January 7, 2018!! Inspired by some hard questions that have literally come to us “out of the mouths of babes”. As we travel this journey together, let us take some time to reflect on who we are, where we have been, and where God is calling us to go, as individuals and as a faith community.